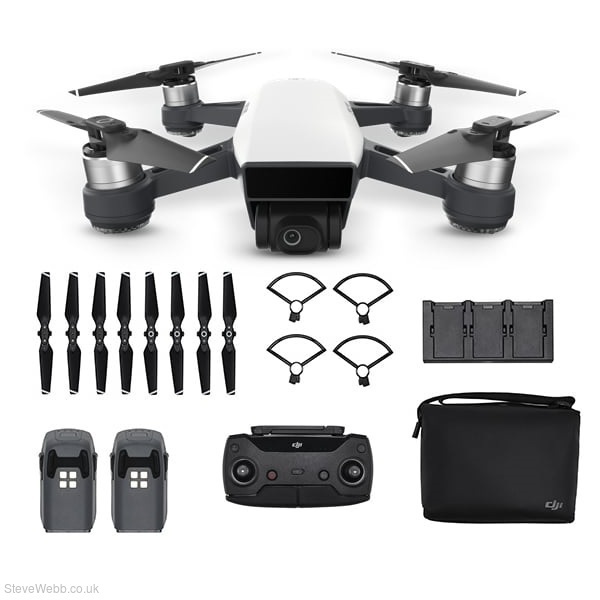 The Fly More Combo comes with the DJI Spark quadcopter, extra battery, extra props, carry cases and a remote controller. For a smooth flight, the DJI Spark offers a variety of intelligent flight modes for smart, intuitive control. TapFly mode offers straightforward control using vision technology – simply tap your phone screen and Spark will fly in the direction of your tap while actively sensing obstacles. ActiveTrack lets you select your subject - such as a runner, skateboard, or cyclist - and track them as they move for a smooth, professional-style video. PalmControl mode lets you use gesture controls to fly the drone - you don't even need the smartphone app or remote to fly. With simple hand motions you can take selfies, guide flight, or even take off and land on your palm. Capture videos with a simple tap or swipe with QuickShot controls which help you shoot professional-style footage with great cinematic composition. You can make precise movements such as circle around your subject, ascend with the camera pointing downward, fly backward and upward with the camera locked on your subject, or fly upward while spiralling around your subject. Capture brilliant videos and images with the high-performance camera which features a 1/2.3” CMOS sensor and powerful f/2.6 lens. You can get creative with panorama and shallow focus photo modes. UltraSmooth technology with 2-axis mechanical gimbal stabilisation dramatically reduces shake and rolling shutter effect for smooth, stable, and detailed shots. 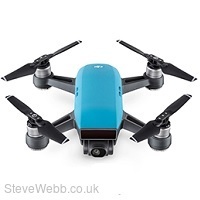 The Spark is smaller and lighter than the Mavic Pro, yet also supports the same Intelligent Flight Modes and delivers impressive flight performance with a maximum speed of 31 mph in Sport Mode and up to 16 minutes flight time. Thanks to an aerodynamic, lightweight, and streamlined design, the Spark soars effortlessly through the air with minimal wind resistance. The Spark offers several safety features so you can fly with the knowledge that your drone is safe. FlightAutonomy analyses the environment to let the drone hover accurately, sense obstacles, and land safety. The Return to Home (RTH) function means if the battery gets too low, connection is lost, or you select the RTH button, Spark will safely fly back to the preset home point. Flight Protection alerts you if you fly near places where drone flights may raise safety or security concerns, such as near airports or stadiums, helping you fly responsibly.